While camping at Agawa Bay in Lake Superior Provincial Park, we attended an evening talk about the Voyageurs. Twilight settled. This scene presented itself. We traveled back in time 250 years. The Voyageurs were the people (usually French Canadian) who transported furs by canoe from the interior of Canada to the ports. The furs, mostly beaver pelts, were then shipped to Europe for the making of felt hats (among other things). Strange as this may sound now, the fur trade played a major role in the history of Canada. It was an early economic driving force that opened up transportation routes, created settlements, and also led to the creation of The Hudson's Bay Company (now known as The Bay). A Voyageur carried two or more 90 pound packs when portaging between waterways. Moving those big canoes must have been an equally demanding task. Life would not have been easy, given weather, terrain, black flies, mosquitoes, bears and the quality of food. This was hard work with few days off. 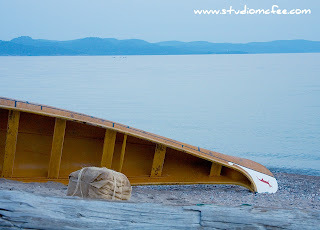 Sitting on the shore of Lake Superior as the night crept upon us, it was intriguing to contemplate the past. On the other hand, it was good to know that Agawa Bay campground has showers. For another view of Agawa Bay visit Agawa Aglow on this blog.